Kaden Single-Handle Pull-Down Sprayer Kitchen Faucet with Reflex in Mediterranean Bronze Inspired by soft curves and crisp edges found in nature to give it a transitional style that accents a wide variety of today's decors. The Reflex system was developed in a kitchen just like yours. By observing peoples' routines, MOEN created pull-down faucets to deliver an effortless faucet experience that makes your day-to-day tasks simpler. 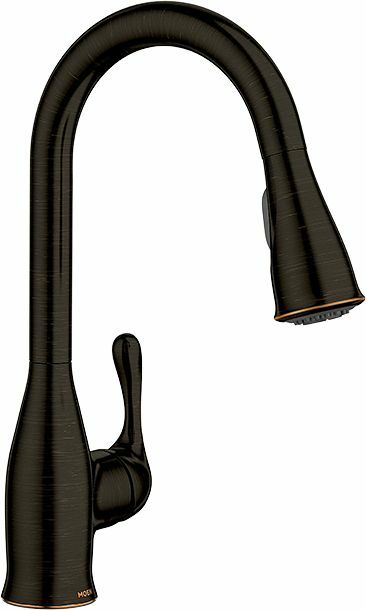 Kaden Single-Handle Pull-Down Sprayer Kitchen Faucet with Reflex in Mediterranean Bronze is rated 4.6 out of 5 by 132. Rated 5 out of 5 by Ed from This Moen sink was very easy to install and looks... This Moen sink was very easy to install and looks great. Rated 4 out of 5 by GC1 from Installation was easy and the quality seems to be good... Installation was easy and the quality seems to be good except for the spray head. It is plastic and it would be nice if it was metal like the rest of the faucet. The arch is not as high as other faucets (including the one I replaced), but not bad. Hopefully this faucet will last well and the finish not wear off. No additional hoses were needed to connect the faucet to the water supply valves. Rated 5 out of 5 by Ross from Great faucet at a good price, rotates easily and handle... Great faucet at a good price, rotates easily and handle operates smoothly! Rated 5 out of 5 by Jim from Yes, everything promised and pretty also. Yes, everything promised and pretty also. Rated 5 out of 5 by Stan from Great delivery and timing as promised.!... Great delivery and timing as promised.! Rated 5 out of 5 by Tina from It is a beautiful faucet. Very easy to install. There is nothing I dislike about it. It paired ve... It is a beautiful faucet. Very easy to install. There is nothing I dislike about it. It paired very well with the sink I purchased from home depot.